No question, the customer was right, images from that lens had to be soft. But, just for completeness, we removed the filter, even though its label indicated it was a high-quality filter. Without the filter, it looked just like it should have. Another thing we do on OLAF is slightly defocusing the image. 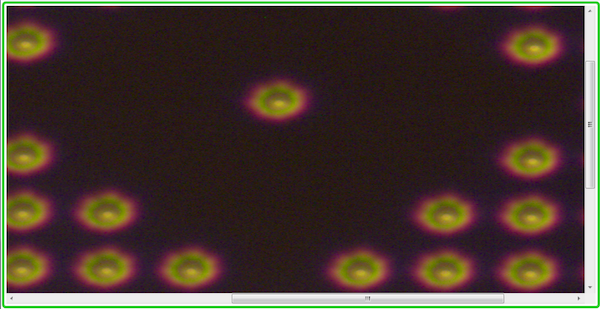 In a nicely centered lens, the dots should turn into regular circles. This is that same lens above, just slightly defocused and looking just like we’d expect. Then we put the filter back on without changing anything else. If you have the slightest bit of visual imagination, you can probably figure out that there would be some bizarre, ugly bokeh with the filter on this lens. 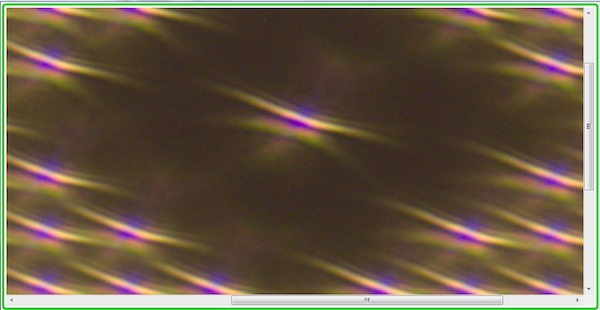 If you’re an optical geek, you might think that perhaps this filter isn’t really flat optical glass, it’s cheap sheet glass with a bit of wavy thickness. There are a couple of things I should mention, just for completeness. 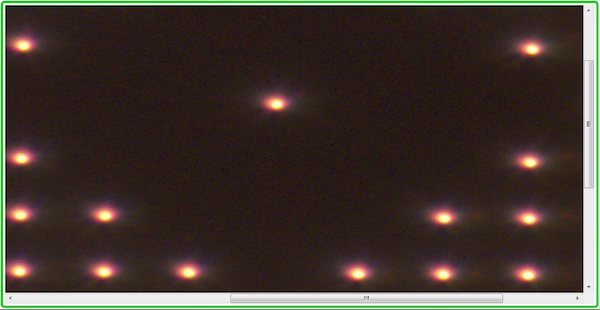 We repeated the test with other copies of the same lens using the customer’s filter, and the results were identical. We also put a high-quality filter on the client’s lens and while there was a bit of blurring of the pinholes (longer lenses are more sensitive to filters), it was very minor. So, if you want to know how much a filter that looks shiny and clear when you look through it can affect your images if it’s a cheap POS, well, there you go. Because if you looked at this filter, and looked through this filter, it would look just fine. And another caution, just because a filter has a name brand on the side you recognize doesn’t mean it’s a good filter. For example, you can buy Tiffen or Hoya brand 77mm protective filters for $15-$18, or a better quality one of the same brand for about $35 , or top-quality for $70+ at a reputable dealer. The $15 filter is not the same quality as the $70 even though they both have the same brand on the side. And if you buy from less reputable dealers all bets are off because knock off cases for the higher priced filters are easy to obtain and the filter inside might not be what you think it is. To learn more about what I think about UV filters in general, read my article on the topic here. There are circumstances where good-quality UV or clear filters are really a good idea. But there are no circumstances where a low-quality filter is a good idea. None. At about 3:50, that is not an MTF test. It is a limiting resolution test with a USAF target. It is impossible to measure an MTF from that target. It would take a pretty severe error in flatness for them to see it in that test — it is antiquated and insensitive. Later you can see them use a konica minolta spectrophotometer to measure transmission. It does not appear that they use it for a spectral test. Later in the video you can see the filter cleaned with acetone. This should never be done, as acetone eats resin – https://www.youtube.com/watch?v=dyjnJaTU70I It doesn’t take long to remove the few nanometers of thickness that will ruin the optical performance. Lee Filters spectrally test every filter, every filter is tested in front of a 200mm lens with an MTF (the lens is image forming and filters can affect MTF reading of that lens). Every filter is tested for flatness. Most scratches will not photographic unless very deep as they are too far away from the plain of focus. For those of us who don’t have an OLAF in the closet, would the following work well as an alternate testing target? Take a sheet of black or middle grey (so to get reasonable light meter readings) and glue onto it either a bunch of small christmass tree ornaments, or steel ball bearings. Iluminate with a spotlight. What you really care about is reflection. Put the filter down on a dark surface. Use a laser pointer and shine it onto the surface at about a 45 degree wall, and go look at the reflected dots on the wall. The brightest dot is the front reflection. The next one is the back reflection. If you see a third one it’s the 2nd back reflection. Flip the filter over and try again. If they are different, then they aren’t coated the same way. UV is a hold over from film days I suspect. I would buy what was marketed as a haze filter, which blocked UV and also had a faint pink cast to partially cancel the effect of smoke and terpines off the forest (blue smog) At that point I shot mostly Fuji slide film as I preferred it’s rendition of greens. Anyway, while digital cameras are not particularly sensitive to UV, film was. UV isn’t hard to add. Tru-vue museum grade (very clear, UV blocking) runs 30 bucks for an 11×17 sheet small quantity retail, so a 75mm filter’s additional cost at this price would be under 2 bucks. And since it is likely just an additional compound in the glass melt, it’s almost certainly peanuts. In the Bad Old Days I would buy new UV/haze filters about once a year. But those were the days of soft multicoatings, and as someone who trying to photograph teens canoeing, hiking, rock climbing, dog sledding etc, my gear took a beating. (I have drowned 4 cameras and smashed two.) Lot of time rain was wiped off a filter with the corner of a t-shirt, or the cuff of my mitten. Take a chunk of dark matt board, or any other dark background. Buy a bunch of the tiny christmas ornaments that florists like to use. If you read this at the wrong time of year, steel ball bearings work too, but tend to escape. Illuminate the target with as close to a point source as you have. A single 1 watt unfrosted LED works well. An unfrosted halogen bulb is probably what most people can find. 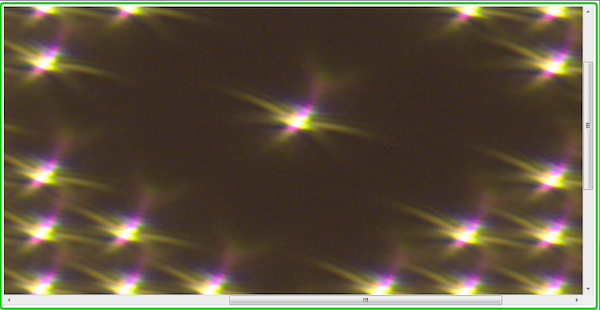 A small round object will produce a very tiny specular reflection. The dark background produces good contrast. First, I’m with the guy that thanks you for the empirical evidence (turning to your original article now). Second – I looked at the OLAF images and wondered if there is a creative way to use the cheap-filter effect… (laugh). my point is that the filter requires about a fifth of a pound of optical glass to manufacture, which will cost about $2 per filter. Grinding and polishing a precision flat at volume has nearly zero cost, and the coating will be << $10 at volume, likely < $1. There are few glass manufactures – outside of exotics you will only see Schott, Ohara, Hoya, and Corning. I do not think you worked at a glass manufacture in a technical or production role from reading your comment. Hello Jeff, LEDs typically have viewing angles large enough so that you shouldn’ t be blinded. And if they have large enough a viewing angle they tend to be not laser diodes. ok, I guess…… Even IF it takes 1-5lbs of glass per filter I think is your point? Because that really thin, flat filter made out of BK-7 is just as strong and resistant to shattering as that 3/4 inch thick piece of curved, higher grade glass called the front element, right? And as you discovered, the greatest concern about impact damage is to internal alignment of lens elements and other internal moving parts. I very strongly doubt they test the surface quality of every filter adequately. To do that you need an interferometer, the setup for which will cost a quarter million dollars. You don’t use a $250k machine to test $25 filters. You wouldn’t (and can’t) MTF test a filter, since it isn’t image forming. They may spectrally test every filter, but that would be outside the norm. Typically one sample flat is taken from each coating run and taken to be representative of all of them. Tilting a filter that is truly flat on both sides won’t do anything for a subject very far away. I live in northeastern NC on the Albemarle sound — beautiful, but the middle of nowhere. Soil is either sand or clay or black mud. In the summer, humidity is 110% on a dry day; so, anything that touches the lens sticks. Sometimes, I just change filters and clean later. I was going ask if slow or inaccurate was a theoretical issue after seeing the OLAF images above. Af, particularly contrast af isn’t going to like the funky flare. My opinion is that if a photographer shoots in messy situations where it might not be easy to protect the lens/camera then a filter makes sense. 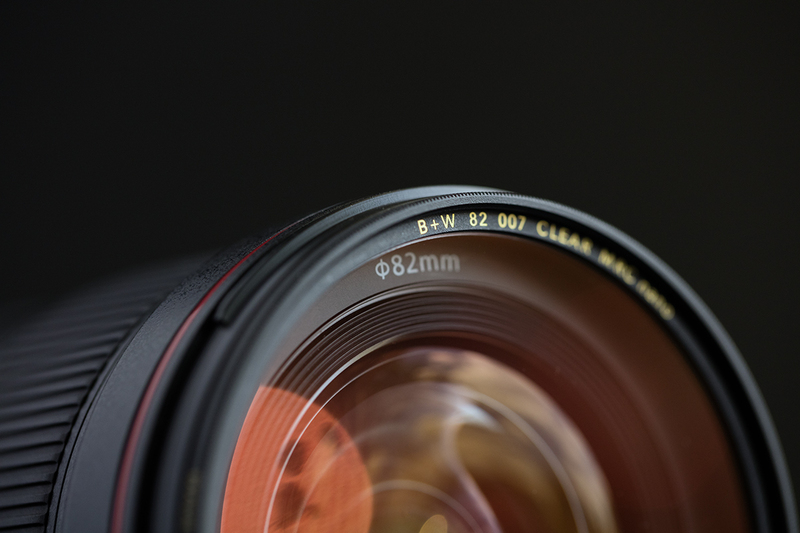 Also, on many lenses, the lens is not deemed ‘sealed’ unless a filter is in place. I take care to protect my gear, mostly shoot in the dry desert, and I’m not a pro with heavy duty usage. I don’t use a filter, and I don’t have any scratches or wear on my front elements. I also ALWAYS use a hood. Great, it’ll be interesting to see just how big the difference is between a crap filter and a decent or good one. I applaud your stubborn stubbornness. Bravo. Well done. Seriously, did I “refuse to acknowledge that blah blah blah”? Did I say ANYTHING remotely close to it? I asked ONE question and you go all Webster on me, and now I”m the one who’s at fault? Seriously? I was challenging the OP that not putting on filters puts his lenses at risk, and thus he’s likely to replace lenses often. You’re the one who refuses to even read at the most basic level. I myself use filters and have rarely had to replace one, except for the two that were cracked when shooting in hectic scenes. How the hell did you arrive at me “refusing to concede that blah blah blah replace filters”??? ONE question, and you were able to derive all that. Keep up the good work. No wait, don’t. And yes, upvotes are the qualifiers of life. I really envy all five of your upvotes. Only 95 left till 100! Sometimes things need to be set in context. Roger mentions most scratches will not photograph shooting into the light on front elements. This is also true of good quality filters including resin filters that some people have an issue with. Resin filters made well use the same optical quality resin used in glasses such as Acomon AG Rav 7 and are pressed between ground & polished steel sheets carefully aligned, whilst the filter is still warm from dyeing. They undergo flatness testing, MTF readings and spectrometer testing EVERY filter. All that said Panavision make a filter holder that tilts the filter slightly to minimise veiling glare shooting into the light, those images are projected far larger than most stills images and whilst we do not dwell on single movie frames none the less focus is often critical. Then after years of doing this wonder why your eye sight has degraded. Small point source LEDs are very bad for the rear of your eye you should never look at LEDs without them being diffused. Well, B refuses to acknowledge the simple fact that whatever destroys a lens front element would also destroy any filter on it. Thus any camera usage that leads to X destroyed lens front elements also leads to X destroyed filters. B also assumes that most people have many of such events (without ‘many’ of such events, there wouldn’t be ‘often’ lens replacements). But B refuses to concede that only people which often need to replace filters would often need to replace a lens front element if they didn’t wear filters. Why that is so remains a mystery. B should also contend with the fact C’s post got five upvotes while B’s posts got zero upvotes.